4-Word Review: Goodbye doesn’t mean forever. 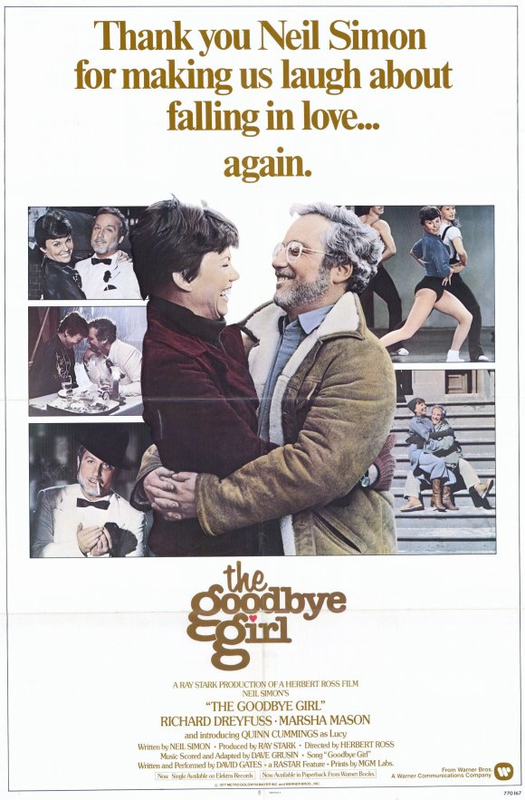 Paula (Marsha Mason) is a ‘dumped on’ single parent, whose live-in boyfriend has just left her, and now must contend with Elliot (Richard Dreyfuss) a rather obnoxious man who is subletting the apartment. Despite long odds the two end up ‘falling in love’ in this rather obvious, mechanical love story that is finely tuned to the female, especially those from that era. (The macho guy viewer will have run out of the room long before David Gates even has a chance to sing his soft rock title tune). This was made when writer Neil Simon was still considered in vogue, although his patented one-liners are sparse and when they do come they are more cute than funny. This in some ways seems a retooling of his earlier ‘lovers in a New York apartment’ film Barefoot in the Park. Only here it’s a little rougher around the edges so it can appeal to a ‘hip’ audience. No clean-cut, cutesy newlyweds instead these people are more jaded to modern sensibilities and will routinely live with their partner even when they are not quite yet divorced. If you can get past a rather strong late 70’s feel (gotta love that Fonzi poster hanging in the bedroom) then the characters remain solid and believable. No beautiful models living lavish and exciting lifestyles. These are average people just trying to make ends meet and find a little happiness along the way. It also doesn’t just show them when they are together, but also when they are out and alone in the ‘real world’, which allows us a rounded and sympathetic view of them. Dreyfuss basically plays his usual opinionated, abrasive self. Whether the viewer sees the intended charm underneath is completely up to their own personal tolerance. His performance is good, but not exactly screaming for an Academy Award, which he won anyway, but then poked fun of it when he later hosted ‘Saturday Night Live’ on May 13, 1978. Mason, who at the time was married to Simon, is the one who should have won it. Her performance is both believable and fluid. You truly see a lot of everyday people in her characterization and she clearly carries the film. Quinn Cummings, as Paula’s daughter, is cute without being too precocious. Her sensibilities help compensate for the sometimes emotional immaturity of her adult counterparts. Though it really looks and seems dumb to have a ten year old still smearing food on the edges of her mouth and wearing a big napkin around her neck while eating. Although I don’t always have a great eye for continuity errors this one has a doozy. When Dreyfuss comes home one night drunk he knocks over a table with a lot of stuff on it. He sticks his head out the window to shout something into the night air and then two seconds later comes back to where the table is standing and everything on it is neatly set. This entry was posted in 70's Movies, Academy Award Winners for Best Actor, Comedy/Drama, Movies that take place in the Big Apple, Romance and tagged 70's Movies, Entertainment, Marsha Mason, Movies, Neil Simon, oscars, Quinn Cummings, Review, Richard Dreyfuss, Romance. Bookmark the permalink. I’ve done quite a few Neil Simon shows, I’m surprised this isn’t one I’m familiar with. I’ve spent the majority of my life without having television (at least more than 2 or 3 channels) so that explains why I’m not aware of the TNT movie, lol. But otherwise, weird, very weird. You should feel blessed that you have spent the majority of your life without television. You really haven’t missed much. I am seriously considering getting rid of my cable because with films streaming over the internet, Hulu, YouTube, and the networks themselves putting their own programs on the net right after they have aired you really don’t need it at all. I really like hearing you say that you are glad you missed out on MTV. I was a teenager in the 80’s when MTV was considered the ‘coolest’ thing around and all my peers were addicted to it. Personally I like to create my own thoughts and images when I hear a song and not have it interpreted for me. I also didn’t like the forced hipness nor the vapid veejays that the channel had. The funny thing now is that they don’t even show any music videos at all anymore and are nothing like they were when they started, which just shows that if it doesn’t last then it must not have been too great to begin with. I love the Golden Oldies and it sounds like you were brought up right. I don’t particularly care for Madonna. She always seemed more like a self-promotor than a true artist. I also have never found her to be all that hot or attractive. I would actually choose Lady Ga Ga over her. I thought that time she wore that dressed made entirely of raw meat to the awards show was great. I liked Lady GaGa’s earlier stuff. Her last album felt like it was too…intentionally done, if that makes sense. As for Madonna, I like some of her songs but have no strong opinions on her as a person. But give me Lennon or the Doors any day. Lol, you should see my record collection! I haven’t heard Lady GaGa’s latest album, but I think I know what you mean. Sometimes these artists when they get rich and famous start to coast too much on their past success and their new stuff becomes less inspired and creative. I love The Doors. I will be reviewing a Charles Bronson movie in March called ‘Rider on the Rain’, which when Jim Morrison saw it inspired him to write the song ‘Riders on the Storm. The film itself is so-so, but the rainy opening sequence, which is what inspired Morrison when he saw it is excellent. I seem to remember my mom liked this movie when it was on HBO a lot in the late ’70s, early ’80s. I was a fan of Simon even as young as I was. Probably more then than now. Simon’s popularity definitely peaked in the 70’s and now you hear very little of him. Although his scripts and plays are still funny to some degree they also seem now a bit shallow, cliched, and dated.